Have you discovered Perth's most attractive fine arts gallery yet? 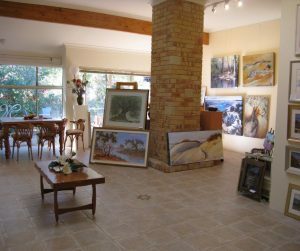 MONET GALLERY is just 12 minutes down Kalamunda Road from the hills and is at the western gateway to Old Guildford via the Helena River Bridge. It's rustic, rumbled bricks and arched portico give a charming French Provincial facade to the 3 galleries within. It is South Guildford's best kept secret! 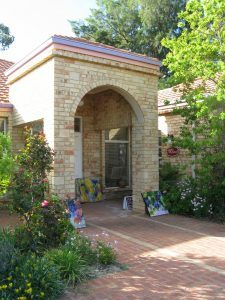 Monet Gallery houses original art works by over 40 talented West Australian artists from both metro and country area. Artists hail from as far afield as Esperance, Denmark, Bridgetown, Bunbury, Margaret River and the Avon Valley. To the right is a walk-way to the Swan River just 2 minutes away. Bring a picnic and have it on the banks of 'The Swan'. This hidden section of the river is a quiet, historic part; one which is still unspoiled yet so close to the highway. Why not surround yourself with beautiful paintings while enjoying the gallery's peaceful, inviting ambience? Give yourselves 'time-out' from your busy schedule! The gallery opened in 2003 and has now established itself as the perfect place to find affordable, interesting originals for your home or work place. The atmosphere is friendly an you need not necessarily know a lot about art to have a browse, make a purchase or just enjoy a chat with owner/artist Maureen Sylvia or the many artists who come and go. 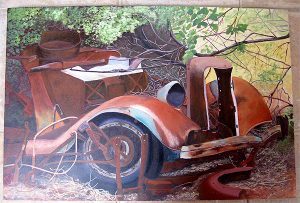 There is always a changing, yet comprehensive, mixed exhibition in the Provence section and from time to time solo exhibitions in the main Monet Gallery with its roof window, glassed back wall and brick column feature. The scores of paintings vary in style, medium and subject matter as well as price, and cater for all tastes. 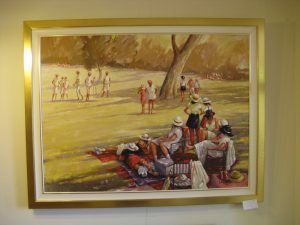 The gallery is all about show-casing beautiful, West Australian works, whether representational, impressionist, or abstract. Some paintings are more contemporary than others. Monet Gallery of Fine Arts in Western Australia is at 85 Great Eastern Highway, South Guildford set amidst residential homes and light industrial, not far from 'West-Trac', and not far from the Kalamunda Road T-junction. It is very accessible from the hills, Swan Valley, Midland area and the domestic airport once you actually discover where it is. Why not see for yourself? Please phone 92773685 gallery hours for more information as to when these events are on and to put you on our mailing list. ENTRANCE IS FREE and is well worth a visit. Monet is attracting a large number of talented, well-known artists and a growing following of regular viewers. Maureen, gallery owner and curator, believes beautiful artworks enrich our lives and welcomes all who enjoy art whether browsing, buying. Many artists inspire with their talent! Why not put Monet on your weekend 'to do' list. Children are welcome too.